All transactions are safe and secure with a reliable history in online purchasing behind each of our associates. Buy the Damn it Feels Good to be a Lannister t-shirt to own Game of Thrones clothing and merchandise. The chains and gold lion design on this Game of Thrones shirt lets everyone know that you're part of the wealthiest of the noble families, the House of Lannister. They rule the Westerlands and live on the shores of the Sunset Sea in Casterly Rock on one of the many gold mines the family controls. If you want to 'hear them roar' be sure to watch HBO for the A Song of Ice and Fire TV show adaptation. Pair this tee with a House of Stark shirt to let everyone know that Winter is Coming. 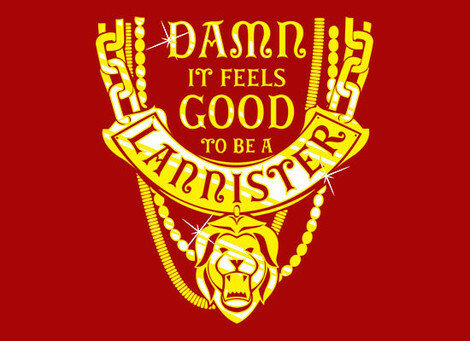 In addition to the Damn it Feels Good to be a Lannister tee above, browse the Game of Thrones Clothing Gallery for more apparel like men's and women's clothes, kids shirts or hoodies.